The foot bone is connected to the ankle bone the ankle bone is connected to the leg bone the leg bone is connected to the hip bone and so on and so on. If you learned this song growing up, I want you to sing it again and really think about what it is saying. Everything is connected, and when you are trying to achieve balance that is a major lesson! Just like you really can’t spot train to lose weight, the same is for balance. 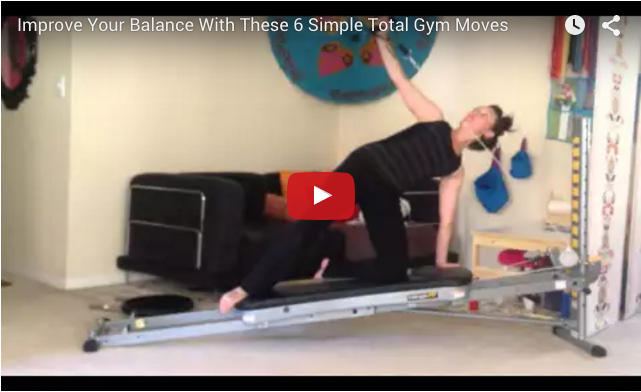 You can’t only work on one part of your body or do one exercise to achieve balance. It takes a full body involvement at full body strength, because everything is connected. Balance comes from a number of things. Secure joints, strong hips, proper hip alignment, a strong core (meaning abdominals and back muscles), balance can even start in the strength of your ankles. We could even go as deep to say sometimes your balance or lack thereof could be coming from a problem in your inner ear, which in turn can lead to vertigo that throws off your balance. I like to think of the word, balance being more than just …can you stand on one foot? But, is your body, as a whole, balanced to allow you ultimate balance? As we get older our balance gets worse, our muscles get weaker, our backs round over (meaning our posture isn’t as upright and aligned). We aren’t as active as we were when we were younger therefore our foundation for balance and movement isn’t as strong. Look at yourself in the mirror, how do you stand? Is your body in alignment, do your feet internally rotate, externally rotate, or are they parallel? As we age our legs start to turn out more to help us balance, because in external rotation your body has more support with your feet turning out. You might think what does my brain have to do with my balance? A lot! Our brains are our motherboard; it has control over our bodies. Without the health and wellness of our brain our bodies are in trouble as how to function. Here is a great explanation from the book Pilates on the Ball by Colleen Craig. “First there is concentration, the kinesthetic awareness that allows you to focus the mind on what the body is doing. You may need to create a quiet space in order to achieve this level of concentration. You are using the mind to reeducate the muscles, and you should be totally present with the body at all times during this work. Concentration brings with it CONTROL. The neuromuscular coordination that guarantees movements will not be careless or haphazard. Sometimes our bodies do not perform as we want them to, but coordination and control are skills that can be learned through practice”. I guarantee you that the surfer, skier, dancer and gymnast are not thinking about going shopping when they are training or performing. They are all present in the moment, fully focused on what their body is doing and how it is moving. Tip: Remember you are trying to train your hips and legs, proper alignment is key, try keeping a neutral spine. Tip: Remember to engage your whole body while doing this movement, think head to ceiling, shoulders down and back abs in. Start at the top of your board in a kneeling position. Lean forward with chest on your knees. Holding on to the arm cables reach for the tower. Tip: It is very important to pay attention to your posture here. An arched back is needed. Your abdominals should also be pulled in and up the whole time! Holding on to the arm cable pull it until your arm passes in front of your chest in a rowing motion as your arm extends at an angle to the ceiling. Remember, be alive in your body, be actively aware and responsible of how you move and you can achieve balance!